Hershey is hurting from Wall Street to the Great Wall of China. 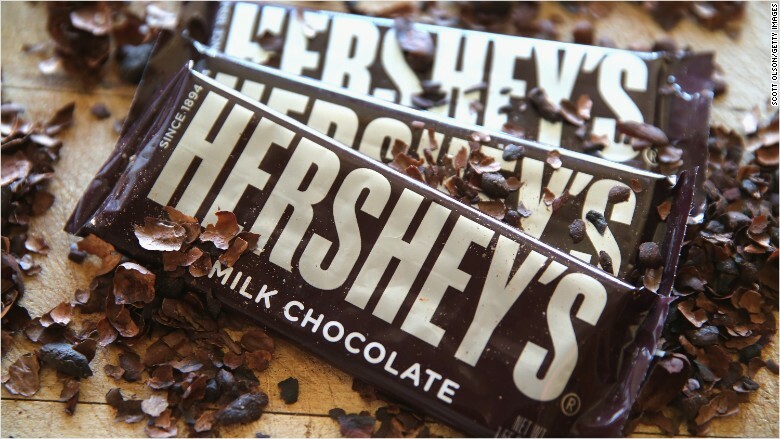 China's economic slowdown and the strong U.S. dollar caused Hershey's stock drop 3% Thursday. Its chocolate sales in China plunged almost 50% from a year ago. That's bad considering the company is pushing more into China. It recently bought Chinese candy company Shangahi Golden Monkey. The sales drop excluded Golden Monkey sales, but one analyst, David Hayes of Nomura Research, even has a rare "Sell" rating on Hershey. Hershey is trying to turn the tide by acquiring snack food companies such as Krave Jerky and Mauna Loa, a macadamia nut company. But those new players aren't churning big profits for Hershey yet. There's another long-term warning sign: Hershey's stock is down 5% over the past year while its European competitor, Nestle, is up 10% over the same time. It's a sign that Hershey is getting hit by the strong U.S. dollar while Nestle can offer cheaper chocolate because its operates in euros, which have lost value against the dollar. Although the strong dollar is great for American travelers, it's a headwind for U.S. businesses like Hershey that are trying to compete abroad.